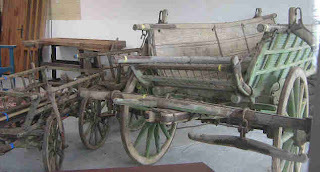 Foreign wagons, large & small, in Motueka saleroom, with 'forks' on the front axles. Wagon wheels are properly made of wood and shod in iron but I go for tyre availability. Wheels I have aplenty: they're what you make when you can't think of anything else to do, like my mother sequentially buying Stead and Simpson green pastel sandals of which she eventually had twenty-four identical pairs. Bizarre. Old people get into odd habits. I merely build wheels. The children's wagon originally had kiddies' bike wheels, and I just winched the cones over on the three-eighths axles thinking the children didn't weigh much and wouldn't bend them. Sean Greenhough put me right. Sean Greenhough was a small lad who you'd notice standing on top of the telephone kiosk, and after he battle-tested the wagon they got replaced with proper stub axles. 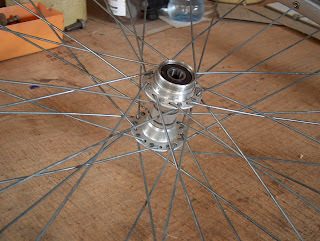 Three-eighths is too small but some Phil Woods wheelchair hubs with a seven-sixteenths bolt, given to me by Peter Carruthers, have been fine. 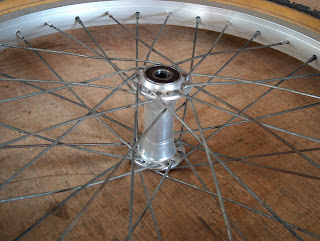 Wheelchair hubs are obtained from my wife's mother's wheelchair, which you leave propped up on bricks. - She won't notice. - Otherwise 12mm is the normal minimum. 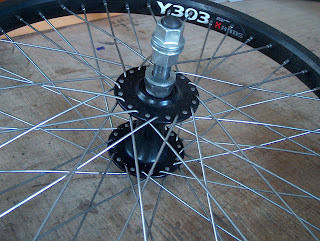 Nowadays BMX front wheels have 14mm axles and the cheap ones have cones which can be wound across to one side to make a stub axle. I found two 36 hole hubs but they're normally 48 hole. The expensive ones with sealed bearings have a shoulder machined on the 14mm axle and require more brain power than I have available to adapt to wagons. Welding bolts into a dead axle with my MIG is tricky owing to low power. It's supposed to be 150 amps but I suspect Team Exaggerating Bastards were in control of the advertising department that day, so I cut the ends off my bolts, pop them in the 3-jaw, and machine them into tubes so they don't act as a heat sink when plug-welded into 5/8 mild steel tube. There is not a chance that the bolts will be in line, so I put the wheels on and rotate the dead axle watching the wheel rims wobble in and out, selecting for the top the point at which rim distance front and back is exactly equal as measured with my pointy-lecture-telescopic-pen-thingy. Mounting holes can be drilled through box-section tube, and over-sized spacers machined to a tight length-wise inside fit get poked down into the square tube so the clamping bolt pinches the spacer and doesn't just squidge the box-section. 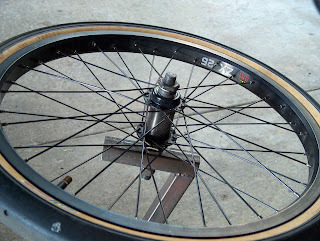 Parallel wheels are vital on a bike trailer for low rolling resistance but slightly less so on a wagon where one only seeks to reduce tyre wear. But welding axles so they're perfectly in line is fiendishly difficult, unless you confine yourself to theory. I would never, ever put a finished dead axle in the vice and straighten it with a big hammer. Never. Not ever. Not even once. Nope, certainly not. Unless I had to.